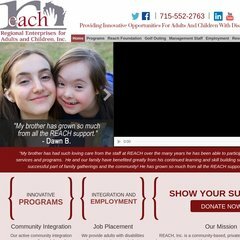 Topics: Reach Foundation, Programs, Golf Outing, Management Staff, and Employment. The site is programmed for PHP/5.2.10. It has 2 DNS records, ns45.worldnic.com, and ns46.worldnic.com. It is hosted by Mci Communications Services Inc. D B A Verizon Business (Virginia, Ashburn,) using Apache/2 web server.